Increase customer retention by introducing a visitor management system clients will appreciate and become dependent upon. Increase lifetime value of your customers by introducing a visitor management system they will appreciate and become dependent upon. Eliminate paper logs, unnecessary phone calls, visitor access guess work and customer complaints. Demonstrate your competitive advantage with Gate Sentry every visitor, every day. Discover how the easiest and most advanced visitor management solution in the market will pay dividends with new and future customers. Be prepared to leverage customer testimonials and word-of-mouth advertising. Three years ago our HOA board appointed a Task Force to recommend a new community access system for residents and an affiliated Golf Club within the property. As owner of the security company providing their guard service I was happy to be appointed to that committee. The system we had in place, using spread sheets for guest lists and phone calls from our guards for new visitors, was simply not working. Potential solutions we researched all had drawbacks including high capital equipment cost, on-going operational expenses, and practical application. 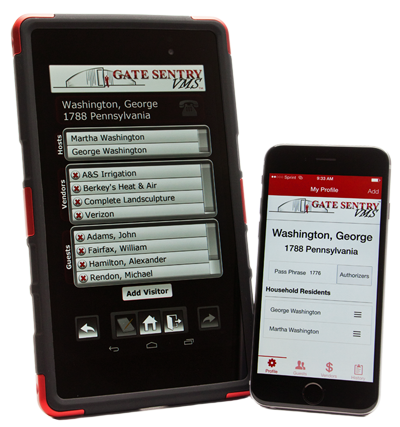 Our Property Manger introduced us to Gate Sentry and we bought into their mobile solution. It turned out to be a great decision by the board. It didn’t’ break the bank and allowed my firm to continue to provide guarded service for the community. Today we have nearly universal use of the system by residents. Our security team is working like champs. Club house staff knows when golfers are arriving for tee times. Sales and catering knows when guests are on their way for meetings and events. What a difference for staff, residents and guests alike. I’ve since introduced Gate Sentry to my other properties and they love it too. Heightened Security. Accuracy. Speed of Access. Ease of Use. Affordability. These things matter to you and they matter to us. Gate Sentry is a completely mobile visitor management solution providing the fastest visitor processing and reporting even when network connectivity is lost. We’re ready to help take your security team where it needs to be, improving all performance metrics, delivering a better visitor experience and creating long-term client relations.